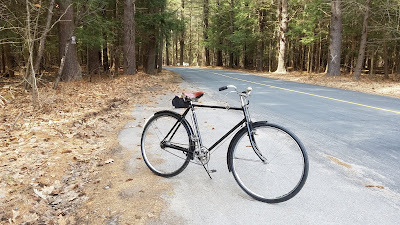 I follow the annual Copake bicycle auction, which happens every April over in New York. 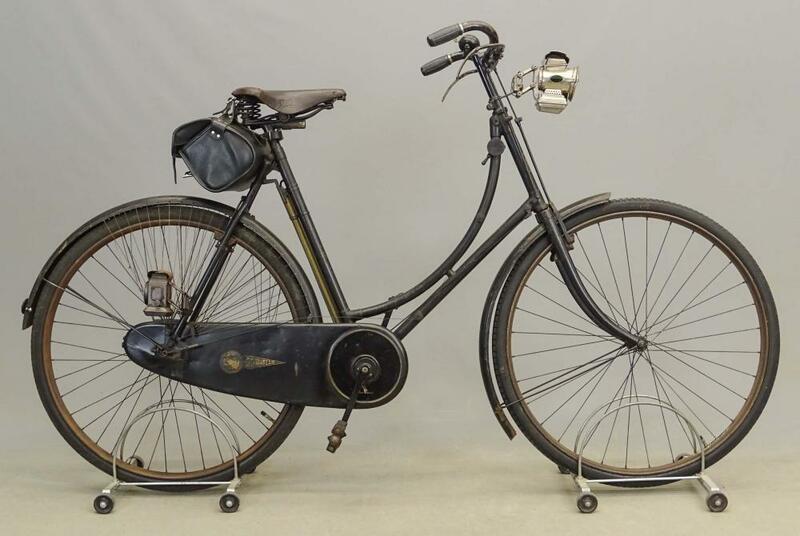 I mainly watch the auction for old utility bikes and roadsters, particularly Raleighs, Hercules, Schwinns, Phillips, etc - classic roadster and light roadster brands. 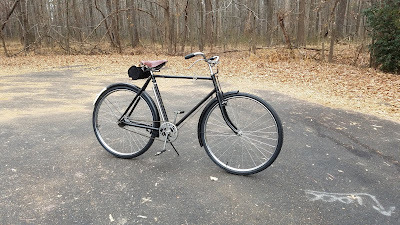 I have a soft spot for the old 3-speed bikes in particular. For $100 this old Raleigh Sorts-style bike was a good buy. Yes, there are a few things missing, but the bike has many of the hard-to-find extras, like the dry battery unit, the tail lamp, head lamp, and rear rack. 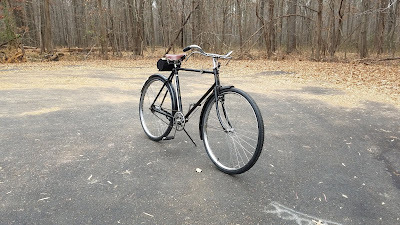 You'll need a few things to finish up, but it's a classic Sports from Raleigh post-war golden age. For $100 this 1974 Raleigh Sports doesn't look like much, until you check the condition. 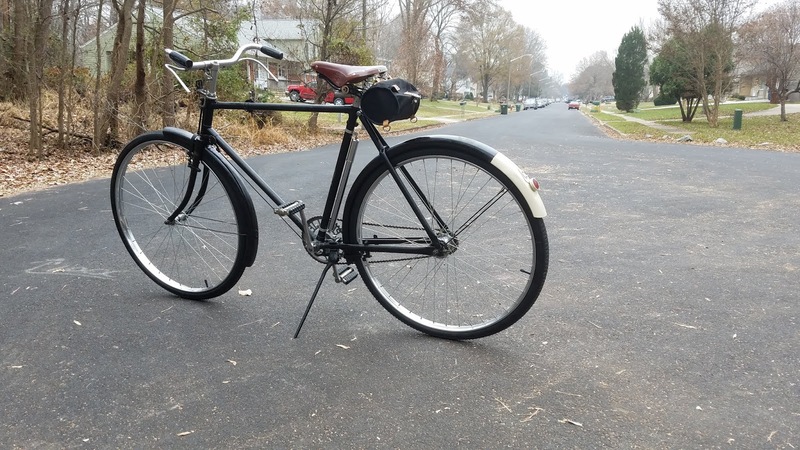 The bike is very complete and looks to be pretty much pristine. I have a soft spot for the 1974 Sports - I've owned one for years and it has served me quite well. This one is a real gem for $100. $70 for this roadster?! That's a steal. Yes, it's a late model, but it's an oddball "Popular" model not usually seen in the US. And it's a full-sized rod brake roadster... for $70... pretty damned good, I think. Another supposedly ho-hum 1970s Sports, or so it seems at first. But for $50? Pretty good if you like the bright yellow color. 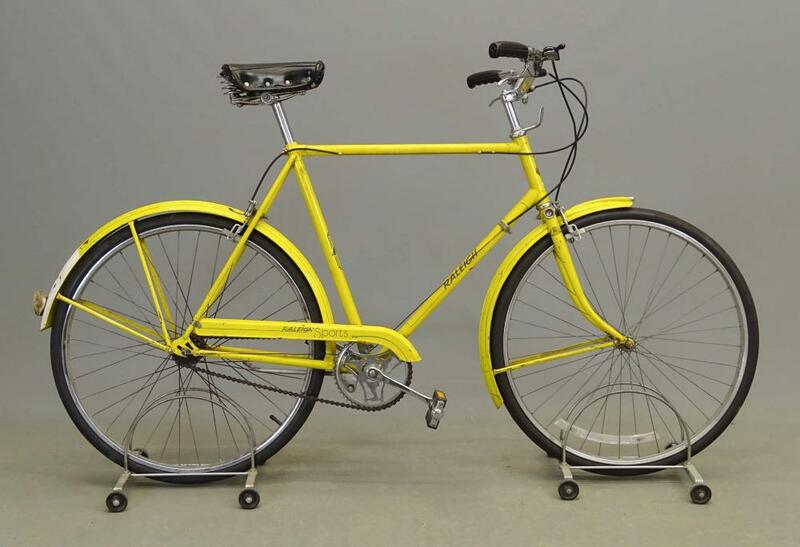 And that's the thing - it's an uncommon color and a solid bike. You can't do much better for $50... if you like yellow that is. 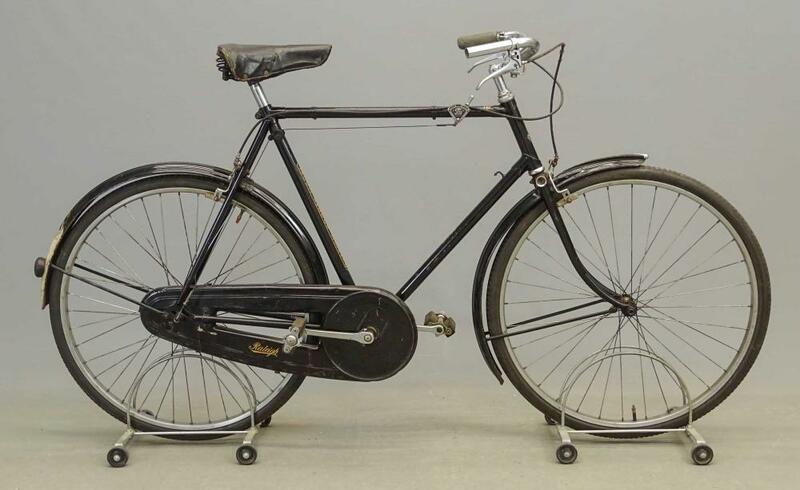 Yes, $400 is a lot it would seem for a ladies bicycle, but this old model Sunbeam is a real gem. We don't see them this old in the U.S. usually, and it has a lot of those nice-to-have additions that tend to get lost over the many decades these bikes have endured. 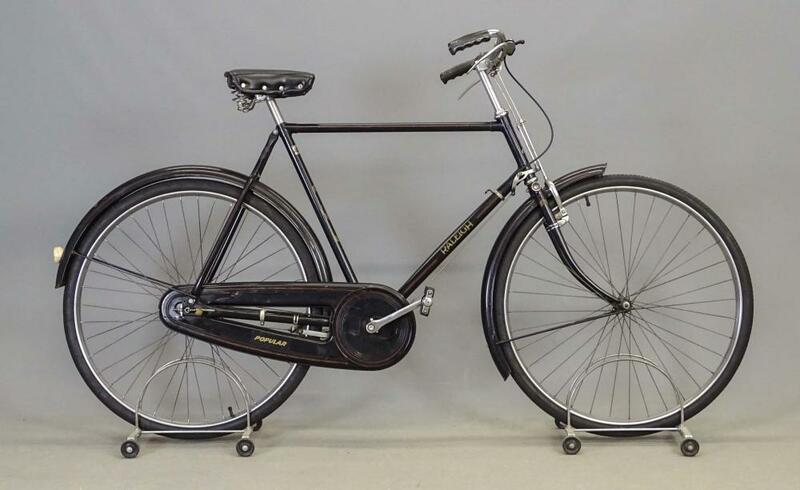 Some lady somewhere probably will enjoy riding this old thing. $60 for this Schwinn New World is a good deal, even if it still needs some work. 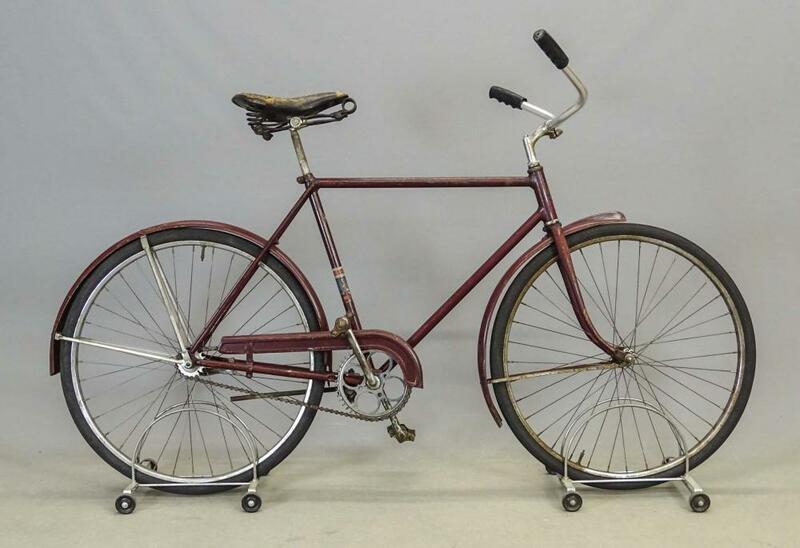 It's a solid, classic American "lightweight" from the early years of Schwinn production. It should clean up and make a great project for $60. 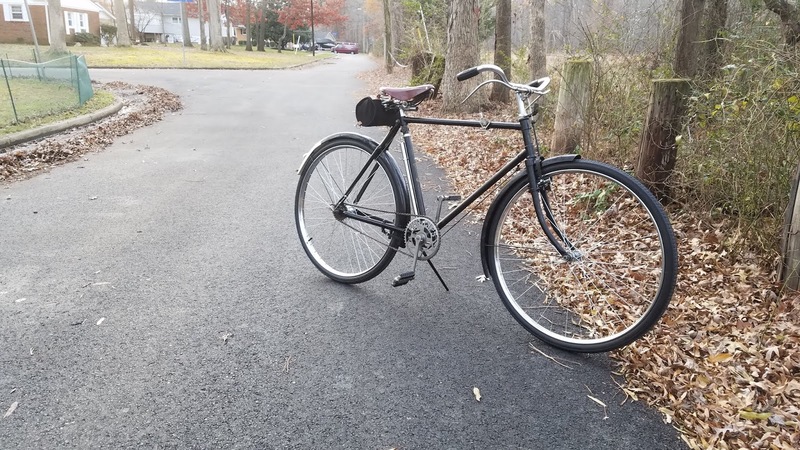 Someone got a killer deal on this Raleigh - $20. Yes, a $20 bill bought this. 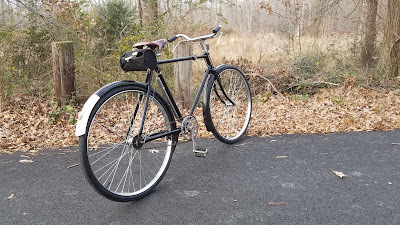 I realist it needs a little work and has to get a chainguard, but this is a very well-made, classic Raleigh that will give good service. How many solid bikes can you get for $20? 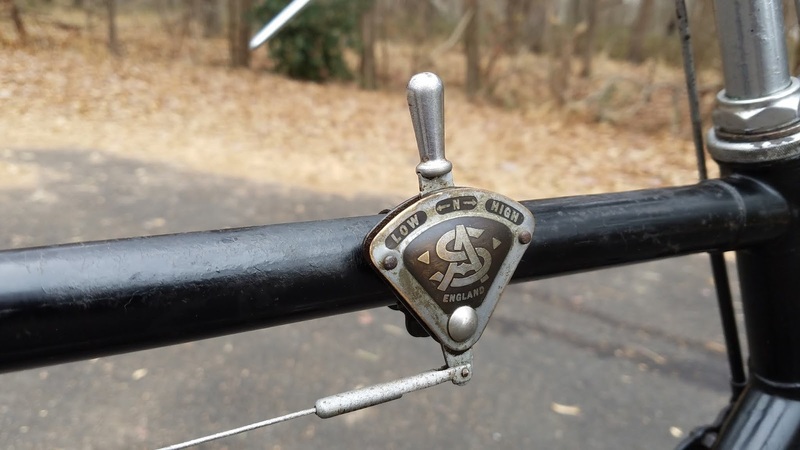 $40 for a 1960 tall frame Schwinn three speed - that's a steal. 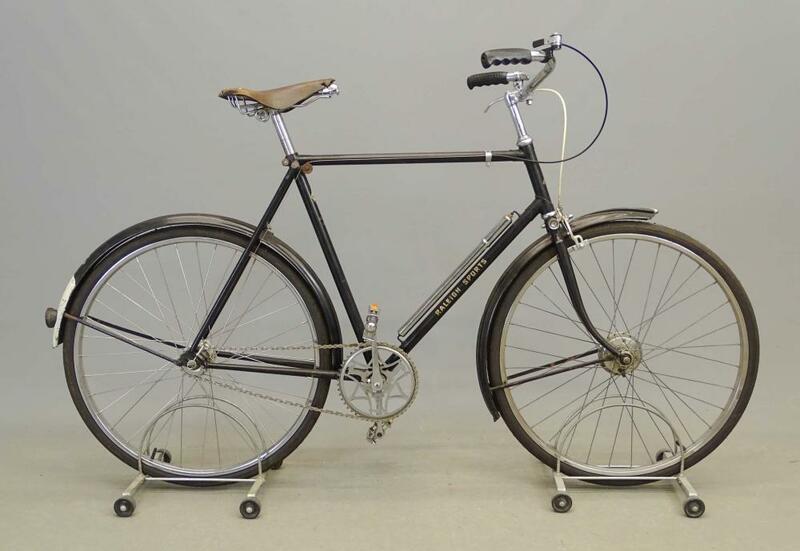 The older tall frame bikes are just not that common, and this one looks to be basically all there. 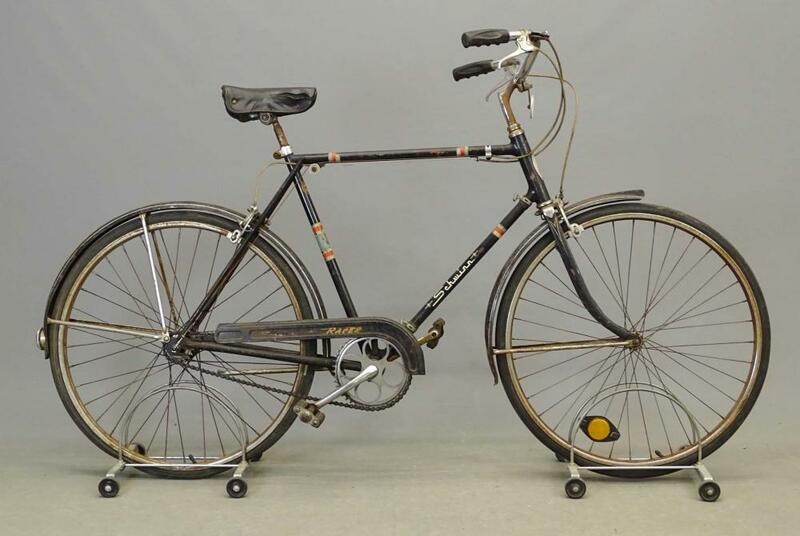 This will clean up nicely and make a classic riding Schwinn for an adult rider. 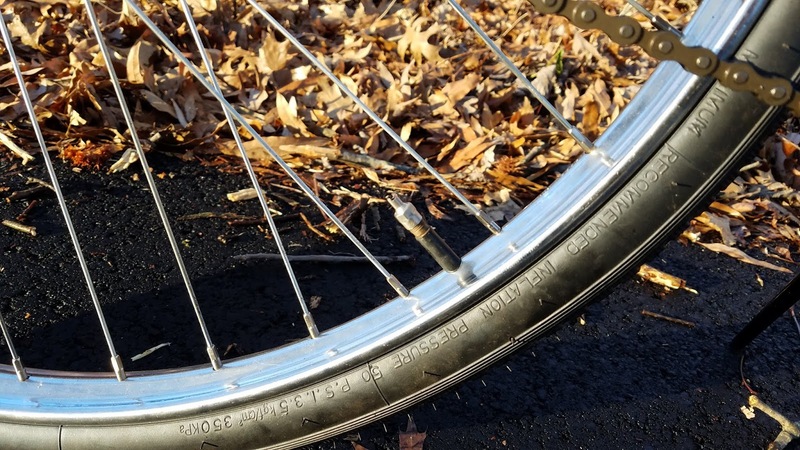 No jamming your knees like the 6 footers do on the 19-inch balloon tire bike frames. This thing is the right size, and at $40, the right price for a good buy. 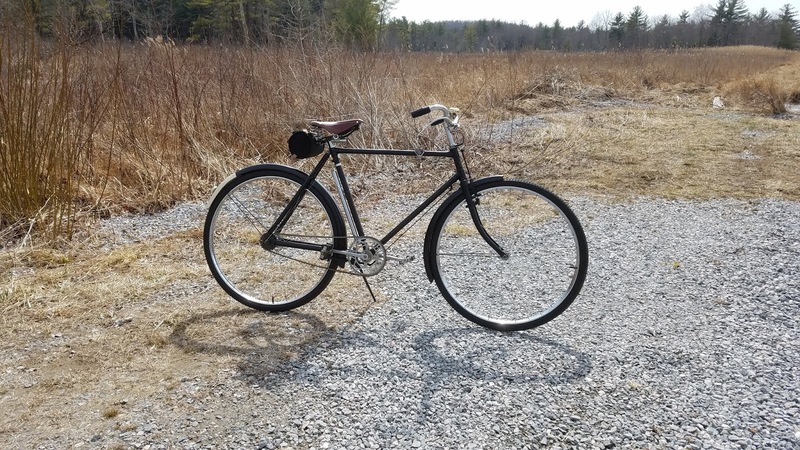 $700 isn't cheap for a bike. But these old X-frame English bikes don't turn up often in the U.S. It's something we just aren't used to seeing here. Somebody snagged a good deal on a bike that's not easy to find in the U.S.
And here, in my view is the absolute deal of the show: a 1938 tall frame Raleigh Sports for $150. It's almost all there, it's really old, and it's from the very early years of the Raleigh Sports with the AW hub. 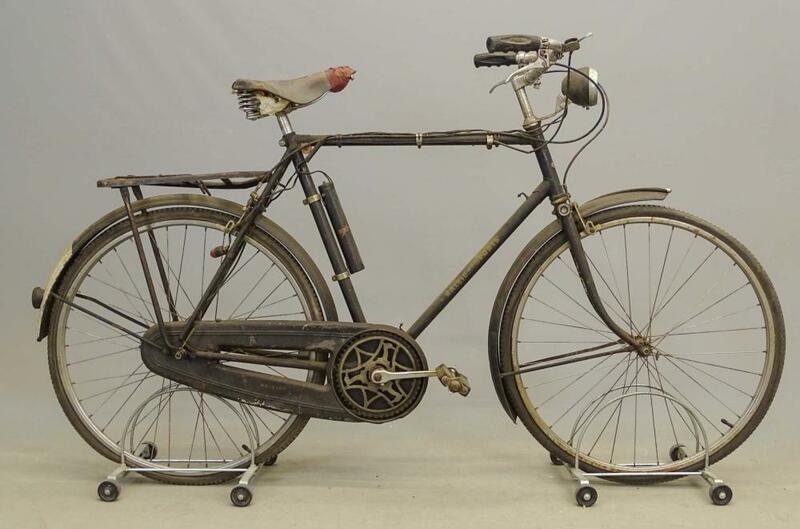 It has the chain case, it's not badly damaged, and it should make a great rider when it's done. And $150 gets you the start of an absolutely killer, early Sports that will fit an adult male rider like a glove. I'm jealous of whoever got this for $150 - hats off to you. 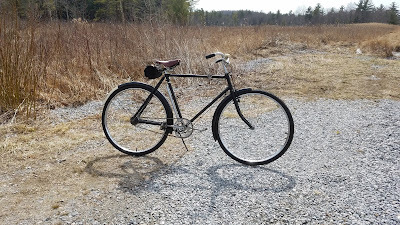 Now that the weather is warmer and the days longer, I finally have re-started my rides. 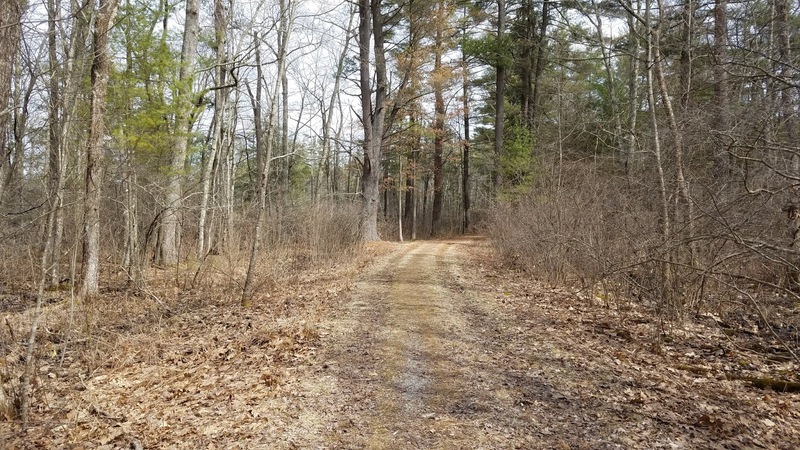 I spent the months of January through March moving to a new home in western New England, about 350 miles north of my old place in Virginia. 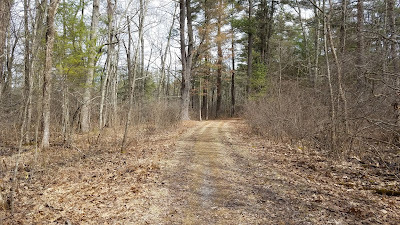 The combination of winter weather and moving stopped me from riding at all. But with 70-degree weather today and lots of sun, I got a chance to take my Phillips roadster out to the local wildlife refuge. 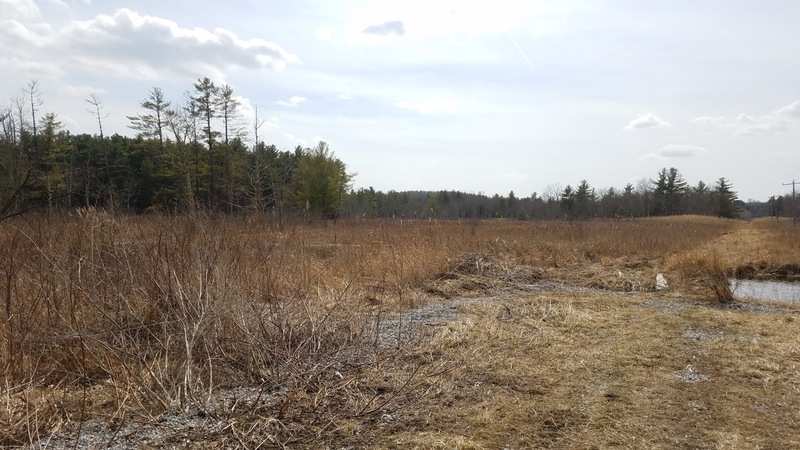 The area is scenic, though there aren't any leaves on the trees as of yet. But the roads there are relatively flat and the automobile traffic is not too fast or busy to ride a bike. The Phillips roadster is pretty close to done. I am very busy lately, but it was a nice day so I took a ride. I have added Bridgeport valve caps (built-in Schrader valve tool). I have also added a bell. This particular type of bell is a new/current production model that I especially like. It is known as the "Origin 8 Time Clock Bell". 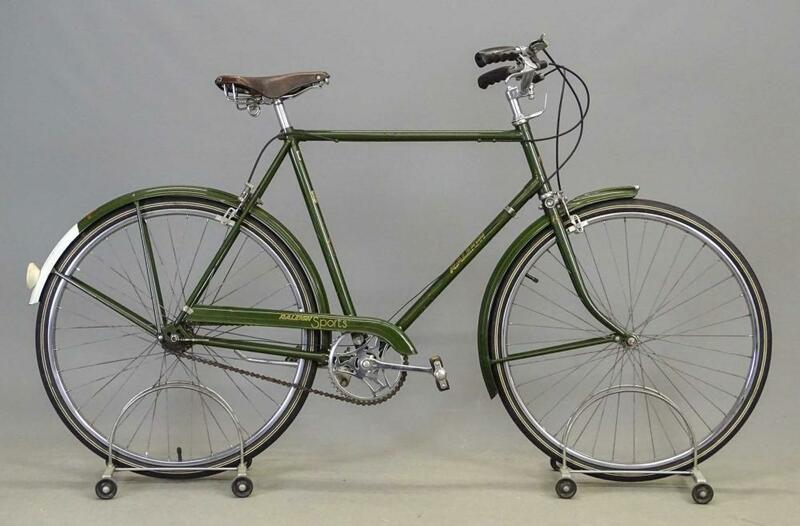 The first of these I bought went onto my Raleigh Export Model. It has held up well so far, and sounds a lot like an old mechanical clock bell, or an old-type elevator bell. The striker is stainless steel and the bell itself is brass. 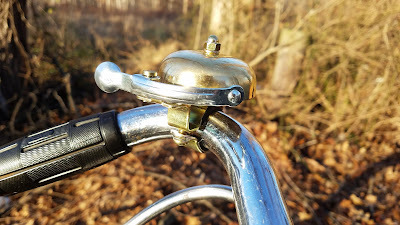 The bell is heavier than some of the other models in production today, but I think it goes really well on these old rod brake roadsters. The other nice feature is that the bell comes with a plastic sleeve that protects your handlebars and which holds the bell securely. A few more pictures of the Phillips roadster in action. I've painted a few screw heads and a few other details. 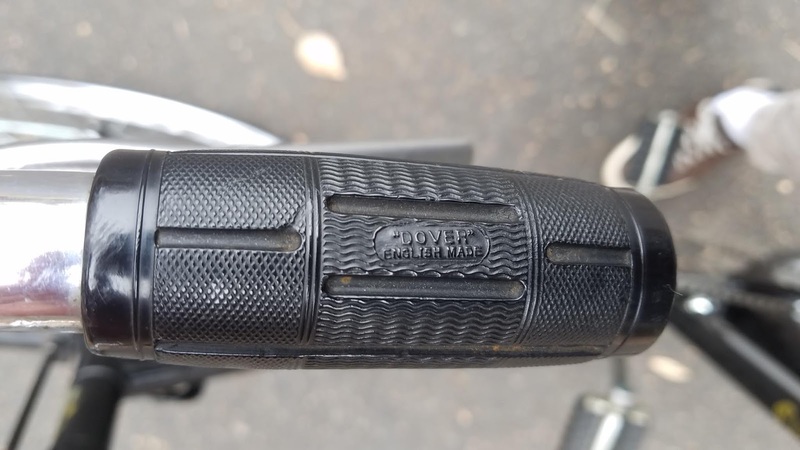 I still need to do some mending on the old Dover Exonite grips. I also need to get a set of Bridgeport Schrader valve caps onto the tubes instead of the modern, plastic domes. But it's coming along toward the finish line. 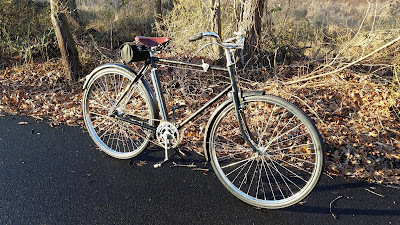 It's a really classic, simple, and handsome old bike. There has been lots of progress on the 1930s Phillips roadster. 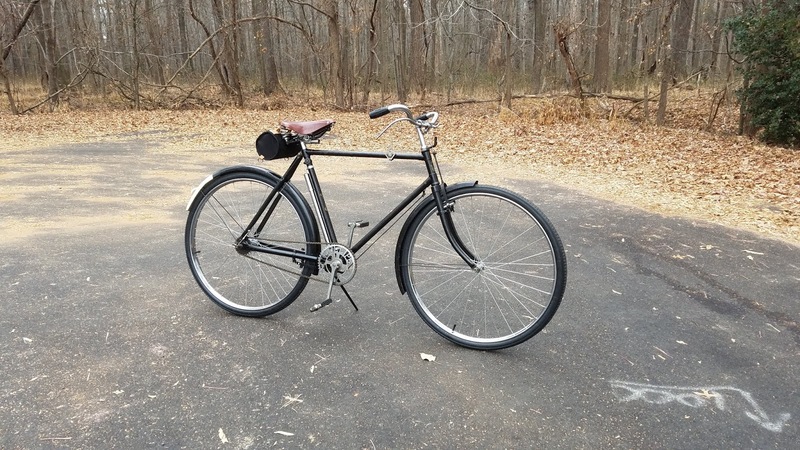 The bicycle is re-assembled and basically is set up. A few, small things remain: painting fender mounting screw heads to match the fenders, repairing the old Dover Exonite handgrips, adding some Bridgeport valve caps instead of the plastic ones, and some cosmetic touch-up here and there. But it's nice to finally have this bike on the road. 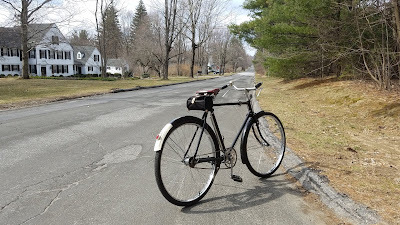 It rides in a manner very typical of the "old type" roadsters from before WWII - gallows seat post; very upright riding position; stubby handgrips; no chain guard at all; and sort of just a "hefty" feel to the bike. The braking is actually not bad at all for steel rims and rod brakes. 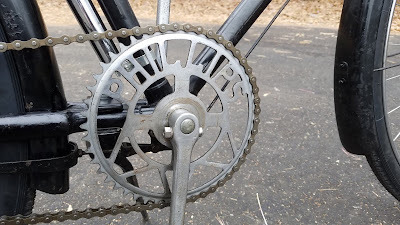 The 1930s Sturmey three speed hub runs reasonably well. 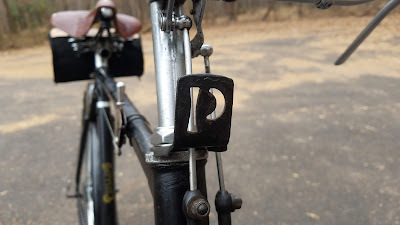 The really heavy, square-cut frame lugs hint that this is an old-school rod brake roadster from the earlier days than the more common, 1970s-era Raleigh DL-1 bikes. Overall, I like this bike. It's very different from the later, more common roadsters we see from Raleigh. 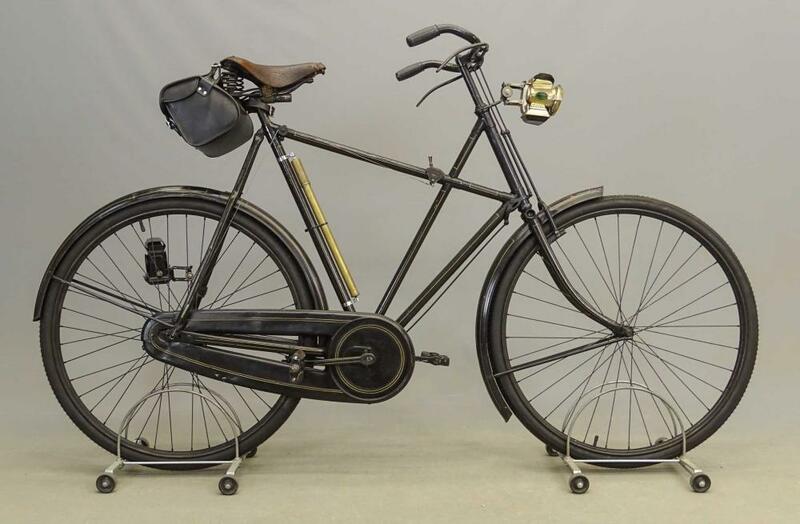 This is a more primitive roadster, that still belongs to the same general family of bicycles. But it certainly is something different. I will say lots of people look as I go by - this old Phillips is certainly different from most of what's on the road today. Oiling Vintage Sturmey Archer Hubs (AW, FW, etc). What Tools Should I Have to Fix an Old Bike? A blog with ideas and thoughts from the Bike Shed workshop. This blog contains a mix of technical information and thoughts on recreational bicycling in general. The Bike Shed. Simple theme. Powered by Blogger.